Last updated on March 22, 2019 By Nat Leave a Comment This post may contain affiliate links. We appreciate you supporting Rags To Niches! Full disclosure here. But now there are apps that allow you to teach from home too! Sounds like a pretty simple side-hustle… But is it? Is teaching English via an APP really a realistic way to make some extra money? Well, there are a bunch of Apps out there that offer similar opportunities. However, today I’m looking specifically at the Palfish App. Who is Palfish app for? Is Palfish legit & worth your time? What Is Palfish App About? The Palfish App gives people the opportunity to make money from home, by teaching English to a Worldwide pool of potential students. You can teach adults or kids, but to teach kids you will need additional qualifications, (I outline this a bit later). How much you can earn seems to vary as you can pick your own rates – but on average people seem to make around the $13 an hour mark. Some people will opt to start out on a lower amount until they get some good reviews and then, raise their price from there. The attraction of using this app is of course that you can teach from your own home, set your own rates and work your own hours. Therefore, it’s the sort of thing that you can fit around other commitments – such as studying, or parenting. In order to get started, you firstly simply need to download the app from Google Play or App store for free. Once downloaded, you need to give them your telephone number and they’ll text you a verification code. You’ll then need to complete a brief application, which I explain below. Before you start teaching, you are required to fill out an application first. 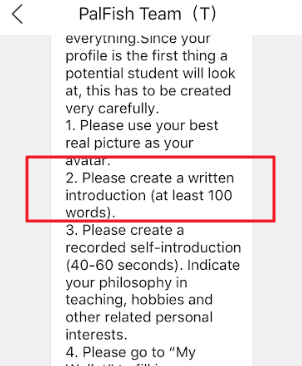 You need to write out a short intro, at a minimum of 100 words and upload a clear photo of yourself, (an individual shot, not with others). You’ll also need to specify your rates, (which you can change later, up to twice per month). What you can provide to your students. You also need to record an intro, which needs to be longer that 30 seconds and show how proficient you are in English. At the time of writing, unfortunately thier payment options only include Payoneer or Chinese bank card at this time. NOTE: You can teach adults or kids; however to teach kids you will need a TEFL certification, they also ask for other additional qualifications such as a degree, or previous experience working with kids. During the application process, (or at any time after) you’re also able to recommend your friends and family to sign up too. You can get a bonus either recommending students or teachers. For each approved teacher, you get an additional 20 RBM and up to 15RBM for students. How Much Can You Earn With Palfish? One bonus with Palfish, in comparison to some other similar Apps – is that you can actually charge your own tuition rates. That said, you would still need to be priced competitively and many people will drop their rates initially, before they have feedback. Also, you are only able to change your rates at a maximum of twice per month. 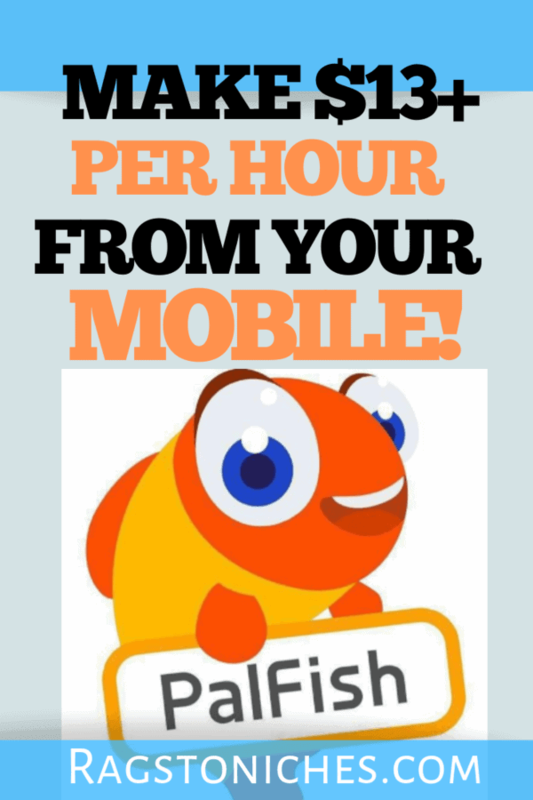 With some other Apps, you will be paid by the hour – but uniquely, Palfish pays by the minute. As mentioned at the start, the average rate per minute is around 1.5RBM – which is over $13 per hour. Income wise, making a decent side-income of several hundred dollars is the most common. However, there are plenty of teachers who claim to be making over a thousand dollars a month and several thousand dollars a month in some cases. If you’re a bit of a night owl, then this opportunity could suit you more than many. That’s because, many of the best hours you can work, tend to be in the late evening, or in the middle of the night. This is due to a majority of students on Palfish, living in China. For some people, this just isn’t going to be practical for them, (especially if they have a day job to get to each morning). But if you’re willing to work some unsociable hours, it would be beneficial to you. Both students who want to learn English & people who would like to teach English for some extra money. Primarily, for most people, this is going to be a side-hustle opportunity and can also give you experience. So, perhaps you’re planning on travelling abroad to teach English as a foreign language. This could help give you some experience prior to this and boost your confidence. It’s also a convenient option for people who are perhaps between jobs, studying, working part-time, or are stay-at-home parents. Really, it’s for anyone who can find the time to do it and think it could be something they enjoy. This app actually has a majority of feedback online. It currently have 4 stars via Googe Play, with almost 1000 reviews. It also has 4.7 stars on the app store – with over 1000 reviews at the present time. While this seems good on the surface, but there are some things that are concerning. I’ve seen several people commenting about some people on there who seem to be using this more of a dating app. Apparently, it’s easy to block people so that’s fair enough, (I guess :/). But perhaps would be uncomfortable for some who are put in that position when they’re trying to be professional. Some have claimed there are also more teachers than students, which is going to make actually finding work very competitive. There have also been plenty of complaints claiming that customer service is lacking. There have been also been many complaints from people who have been unable to upload a photo to the App and therefore, unable to complete the application. Personally, I had no trouble trying to upload my photo! Someone suggested that by uploading a photo before you do anything else, this stops the glitch and you’re able to go through. You can gain experience teaching English, (perhaps if you plan to travel to do it in future). Get extra pay for bringing in new teachers or students. Can only be paid via PAYONEER or Chinese bank card at this time. Some people complain about students being inappropriate/treating app as a dating opportunity. Most people will not make much for their time. The good thing about opportunities like this, is they’re completely free and risk free to try out for yourself. Palfish is not a scam. While it’s not perfect, it is a legit app where you have the potential to teach English from your home, on your smartphone. The earning potential is going to be pretty low for the most part, but still over minimum wage. For example; you may have considered teaching English as a foreign language abroad but are not sure how you’d find it. Whatever your reason for giving this a go, it’s something you can try out easily and see if it’s for you. Making money via Apps and websites is one of the fastest growing areas online and I believe that the opportunities will grow and grow over time. In most cases though, you’ll be lucky to make a couple of dollars an hour with Apps that claim to make you money. This one is at least bit different, in the fact you can reasonably earn a decent side income and even more in some cases. Still, if you’re looking for ways to make money from home, or online in general, there are many ways you can get started. Where your efforts now can be rewarded multiple times over in future. So, that concludes my Palfish App review today…. what do you think? Are you going to sign up, or do you have reservations? If you have any experience at all with this App, I’d love to hear from you! Make Money – Free Cash App: Legit Or Lame? Shopmium Review: Is This Cashback App Worth It?